Karla Briones is an Ottawa-area serial Immpreneur with a passion to encourage and support others to achieve business success. She specializes in helping New Canadian Entrepreneurs to start and grow businesses in Canada. 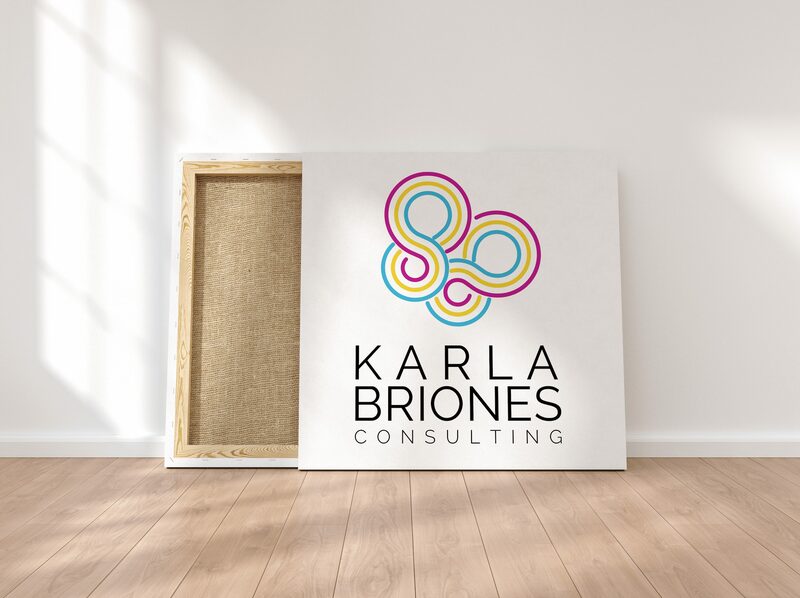 Karla approached Venture Creative Collective to help her create the foundation for her new company, Karla Briones Consulting. She needed a complete brand identity, website (landing page, sales pages, and the main website), stock imagery, logo, graphics for her podcast and blogs, and ConvertKit (email sequence automation) setup. With her ideal clientele being worldwide, Karla could not rely on word of mouth referrals to market her new business. Karla needed a brand, logo, and web presence that reflected her exceptional skillset and would immediately catch the attention of new potential clients from around the globe. 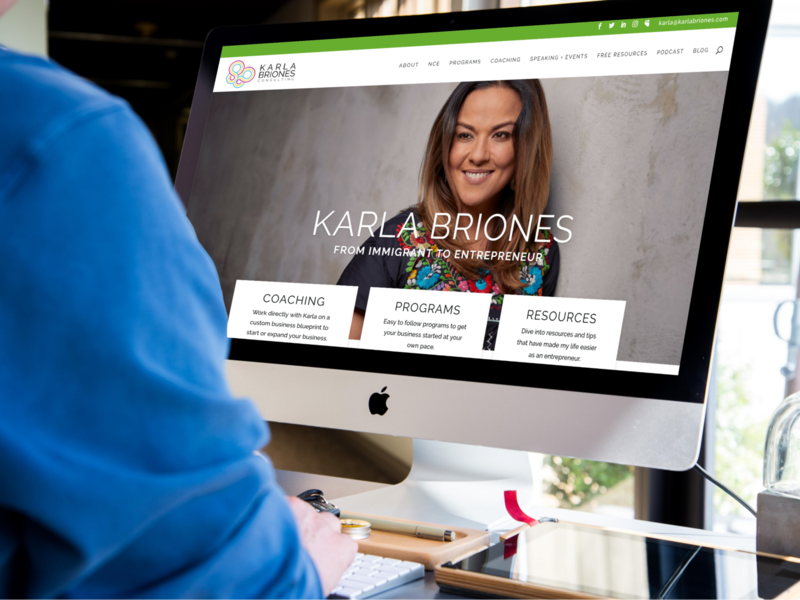 With no existing online presence, search-engine optimization would be key to ensuring Karla’s new brand would be easily discovered in the saturated business coaching niche. As most users search for and contact service providers shops on their mobile devices, a design built for high performance and conversion on mobile would also be key to the overall success of the project. In close discussion with Karla, the VCC team created an ideal client profile, to ensure all subsequent branding would appeal to such a client. Karla’s ideal client wants information immediately available with minimal effort, so a long style pages with a scrolling design (which is especially well-suited to mobile devices) was the most logical choice. Combining a vibrant color palette and unique swirling patterns in an homage to Karla’s Mexican heritage creates a fun yet still professional aesthetic. Snappy, honest copy and clear call-to-action requests keeps the web presence high-level and appealing, while keeping the content easy to consume for readers for whom English is not their first language. This furthers the goal of prompting users who wish to work with Karla to feel compelled to connect with her directly to discuss the program or package she feels is the best fit for their specific situation. After gathering information about Karla’s style preferences and ‘must haves’ through VCC’s Brand Exploration Process, we created a new visual brand identity. Thematic colours inspired by Karla’s ethnic background and country of origin were combined with clean fonts to keep the overall design grounded yet creative. The logo leverages the same elements, while integrating the shape of a butterfly, which represents the journey all entrepreneurs – but especially those who immigrate from other countries – must undergo. This design element was further integrated into the website and branding by using half the butterfly shape as a swirl motif accent. As speaking at events is a integral part of Karla’s business plan, eye-catching branded physical collateral to be given out is an integral part of making the most of these events. 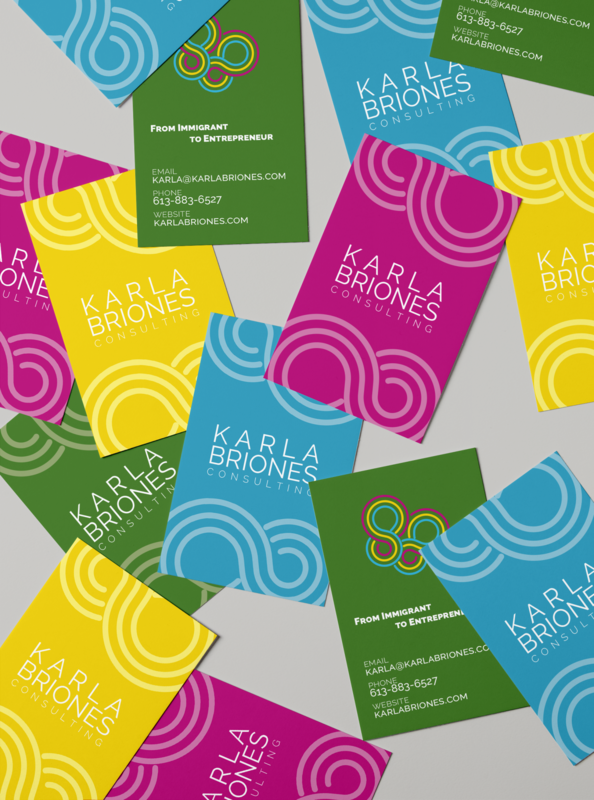 Leveraging Karla’s bright color palette we created a suite of business cards, in each of the brand colors. Initial search engine optimization was conducted to ensure Karla’s new website could be quickly located by her ideal client – busy professionals from around the world looking to move to Canada to start a business and/or New Canadians hoping to start a business or grow an existing one. 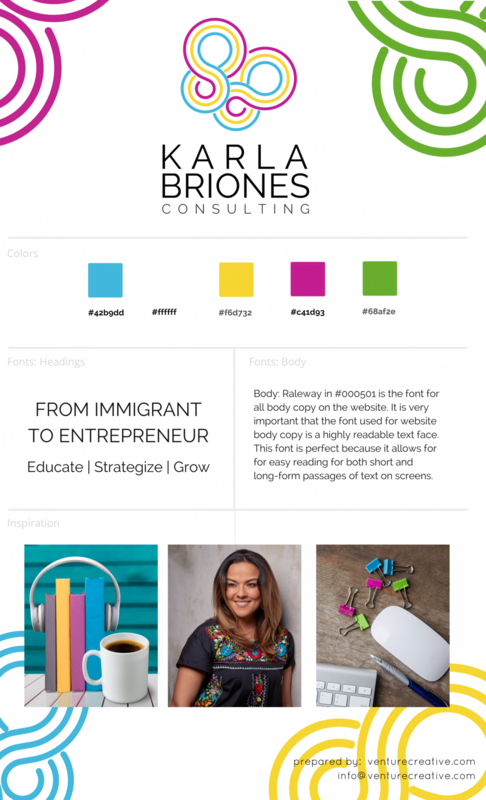 A brand new company ready to be presented to the world – complete with brand identity, logo, and web presence built specifically to attract the ideal client of Karla Briones Consulting exceptional skillset. Every time I look at the logo you created I feel so freaking proud! Not only is it beautiful and colourful, but it is meaningful and tells me a story every time I see it. You really translated what my business is all about into a simple, elegant yet fun design. Having had mostly franchises as businesses (where I don’t really “own” the brand/logos) it is the very first time ever that I want to show the world my logo and what it represents. It’s so darn beautiful. I want to print that butterfly everywhere. It may just be a bunch of squiggly lines for most, but for me, it is me morphing into “what I want to be when I grow up” and helping others too. I just really wanted you to know what I feel when I look at it. Every. Single. Time.